The Japan Racing Association continues to roll out its big races, with one every week at Tokyo Racecourse through the first Sunday in June. 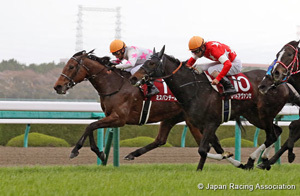 On the heels of the Tenno Sho (Spring) and the 3-year-olds’ NHK Mile Cup and just before the spring classics comes the Victoria Mile on Sunday, May 13 at Tokyo. It’s an all-female event and the only Grade 1 race this month not exclusively for 3-year-olds. The Victoria Mile showcases fillies and mares 4 years old and up, and this year marks its 13th running. The lineup of 18 is one of the headiest yet, boasting six Grade 1 winners, including 2015 Oka Sho winner Let’s Go Donki and two-time Grade 1 winner Soul Stirring. Aerolithe, who beat the boys in the NHK Mile Cup last year, will take on last year’s Victoria Mile champion Admire Lead, looking to become the third horse in a row following Verxina and Straight Girl to win successive versions of the race. In fact the top three finishers of the 2017 Victoria Mile (runnerup Denko Ange and third-place finisher Jour Polaire in addition to Admire Lead) will compete again for a purse weightier than ever at nearly ¥228 million, with a ¥105-million winner’s prize. The 1,600-meter turf event at Tokyo, where races are run to the left, starts at the top of the backstretch and dips slightly from the gate for about 250 meters. The track rises again, dips into the bend, and levels into the 525-meter long stretch, which has the extra test of a slope rising some 2 meters over 150 meters until the ground flattens out over the final 300 meters. The Victoria Mile has often finished in an upset, with the favorite only having won three times in the past – in 2009, 2010 and 2013. Double-digit picks have made the winner’s circle twice before and have figured in the top three spots eight times since the race’s debut. Four-year-olds account for the most winners of the Victoria Mile thus far, having captured the race seven times. Three 5-year-olds have won before and the oldest horse to have won was Straight Girl, as a 6-year-old and again the following year at the age of 7. Straight Girl also holds the Victoria Mile record of 1 minute, 31.5 seconds set in 2016. Eighteen fillies and mares have been nominated for this year’s Victoria Mile, Sunday’s 11th race of 12 at Tokyo Racecourse. Post time is 15:40 local time. Lys Gracieux: Although she has yet to capture a Grade 1 race, Lys Gracieux gets top marks for consistency, having only finished out of the top three twice in her 12 career starts, and both of those races were at distances of more than 2,000 meters. Hailing from the stable of Ritto-based trainer Yoshito Yahagi, the 4-year-old daughter of Heart’s Cry has two Grade 3 wins and a 2-3-3-2 overall record in Grade race competition. She ran second in the 1,600-meter Oka Sho (Japanese 1000 Guineas), where she finished half a length behind Reine Minoru and a neck ahead of Soul Stirring. Last out, she ran a close third to Miss Panthere and Red Avancer in the Grade 2 Hanshin Himba Stakes. In February, she showed her prowess over the Tokyo 1,600 when she topped a mixed field of largely male and older horses in the Grade 3 Tokyo Shimbun Hai. She also won over the same conditions as a 2-year-old in the Artemis Stakes. Yutaka Take has ridden the majority of her starts and is pegged for the Victoria Mile ride, which will find Take, who just turned 49, just four shy of 500 rides at the Grade 1 level. 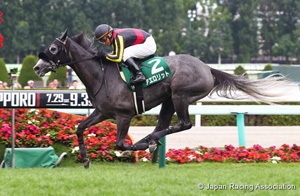 Aerolithe: The 4-year-old gray Aerolithe, who takes after her sire Kurofune (winner of the 2001 NHK Mile Cup), has also demonstrated consistency, but has only nine starts thus far and a 5th, 1st, 7th finish in her three Grade 1 bids. Her three wins have come at distances in the 1,400-1,800 range, with her one Grade 1 victory in last year’s NHK Mile Cup, which followed her fifth-place run in the Oka Sho. Aerolithe’s winning time in the 2017 NHK Mile Cup was a half second faster than this year’s NHK Mile Cup winning time and both tracks were fast. Last out, on Feb. 25, Aerolithe returned after a spell of 4 1/2 months to finish a neck off the winner in the Grade 2 1,800-meter Nakayama Kinen. With that race under her belt, she’ll likely show improvement. In the saddle is expected to be Keita Tosaki, who will be paired with Aerolithe for the first time. Tosaki has two wins of the Victoria Mile, both aboard Straight Girl. In Straight Girl’s first bid in 2015, Tosaki had also been riding her for the first time. Trained by former jockey Takanori Kikuzawa, Aerolithe has the advantage of being stabled closer to Tokyo than those having to make the long haul from Ritto. Admire Lead: Sired by Stay Gold, the now 5-year-old Admire Lead last year went on to win the Victoria Mile after running second in her prep, the Hanshin Himba Stakes. This year, after running fourth in the same race and having preceded that with a 6-3-12 record following the Victoria Mile, Admire Lead is not expected to make the top three picks. Then again, she won last year as sixth choice. Her popularity will no doubt be down at the betting windows this time, but her finish in the Hanshin Himba Stakes was a close one, 0.1 seconds behind the winner while carrying 2kg more than the three who preceded her over the finish line. Ritto-based trainer Naosuke Sugai says, “She had the same rotation last year and we’re getting her ready in the same way as last year. She’s matured both mentally and physically since turning 4 and is no longer bothered by the haul to the track. I’m expecting her to rally.” Last year, Admire Lead was partnered with Christophe Lemaire, but this year Mirco Demuro, who rode her prep, is expected to be up. Soul Stirring: Following her magnificent record from her debut all the way through the Yushun Himba (Japanese Oaks) (five wins and a third), the Frankel-sired Soul Stirring failed to make the board in her next four outings (two Grade 2s and two Grade 1s), in which she was competing against male horses at the Grade 2 level and above for the first time. Her last start, the mile Hanshin Himba Stakes, saw Soul Stirring return after over 4 months to finish 10th amid a pace that didn’t suit her. Though this will be her first Tokyo mile, Soul Stirring has run five of her 10 starts at Tokyo and won over 1,800 meters. Sharpened from her last race and with a stronger pace, she surely has what it takes to make the money. Christophe Lemaire, who has ridden all of her races except the Japan Cup, is to be in the irons. Miss Panthere: Though she turned in double-digit finishes in both her Grade 1 bids last spring, the Daiwa Major-sired 4-year-old Miss Panthere has been doing just fine since last fall. 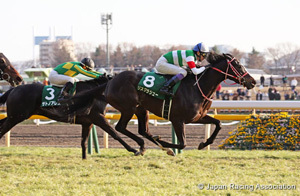 She’s now on a four-way winning streak, having aced the Grade 3 Turquoise Stakes over a mile in December, the Grade 3 Kyoto Himba Stakes over 1,400 meters in February and, last out, the Grade 2 Hanshin Himba Stakes over a mile on April 7. This will be only her second start at Tokyo, her first was the Japanese Oaks, in which she finished 10th. All of her other starts have been over right-handed tracks. Miss Panthere went wire to wire last out, but can race from any position and it is believed she can handle the Tokyo mile as well. Word has it she has lost the furry winter look she still sported last out and the sheen is up on her new coat. She did have the weight advantage last out, running under 54kg, but will carry 55kg this time, as will all runners. Norihiro Yokoyama is set for the ride. Others to watch include darkhorse Denko Ange, a 5-year-old by Meisho Samson. She surprised as 11th pick when she finished second in last year’s Victoria Mile. 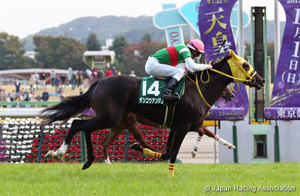 She had come off a fourth in the Fukushima Himba Stakes then, and this year she ran third. Her 1st, 2nd, and 4th finishes over the Tokyo mile thus far bode well. The 4-year-old daughter of Manhattan Cafe, Dea Regalo is a longshot that has yet to take on a Grade 2 race, but is making the leap up to the top level after running a close second to Miss Panthere in the Kyoto Himba Stakes. Red Avancer, by Deep Impact, is another from the Hanshin Himba Stakes group to watch. She ran second in that race and has been consistent at the lower levels in the mile range.